Our goal is to offer customers a comprehensive circular saw blade range suitable for all applications. This is the reason we developed, in tandem with the steel cutting range, an HM saws range suitable for metal alloys, and also for wood, MDF, laminated, hardboard and multilayer panels. We can produce all the range of Dry cutting circular saw blades to fit on portable machine like Bosch, Makita etc. We can also manufacture special saw blades on customer request. 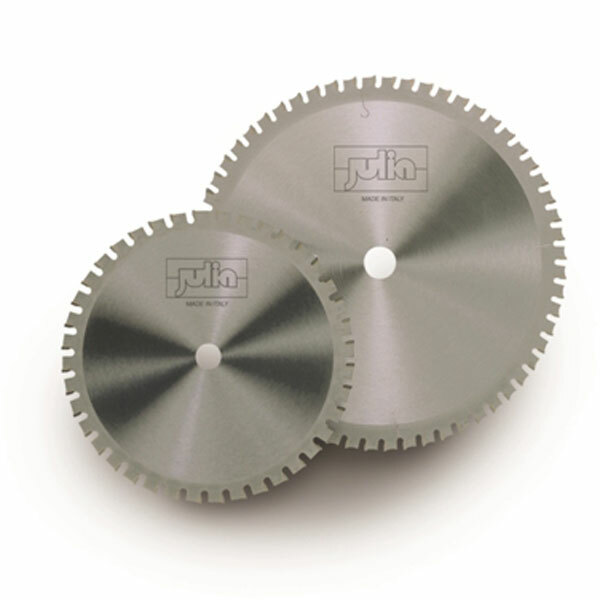 Julia produces carbide tipped circular sawblades to cut light alloys such as aluminium, zinc, copper, brass and bronze. The tooth geometry is trapezoidal with a negative or positive cutting angle. Thanks to our special teeth geometry and the noiseless system we can also reduce vibration, resulting in an excellent surface finish. All these blades can be used on automatic and manual sawing machines, for cutting tubes, profiles for window frames, and solid materials. Starting from these kind of blades Julia has developed a cutting tool dedicated to sandwich panels made by a layer of insulating material placed between two corrugated steel sheets. In this case teeth are sharped by sectors in order to reduce vibrations developed during this particular application and increase blade life. 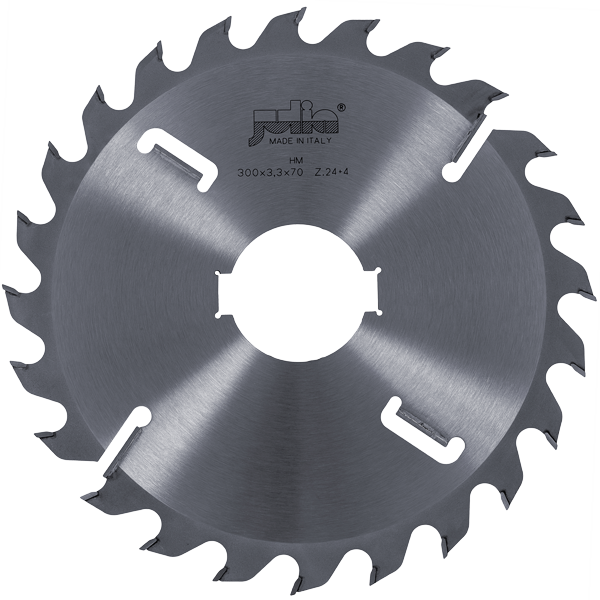 Julia manufacture a complete saw blade range for the wood industry, including universal saw blades, blades for panels, for multirip saw machines, scoring blades, and dividing saw blades. The universal carbide tipped circular sawblade is available with or without chip limiting teeth, for ripping and cross cutting of massive wood (soft, hard and exotic wood) and frames. The geometry, with alternate tooth and positive cutting angle, is also suitable for rip cutting thick boards, as well as producing a good finish on long fibre and damp wood. We also carry stock blades for panel cutting, as well as MDF, laminates, hardboard and multilayer panels. 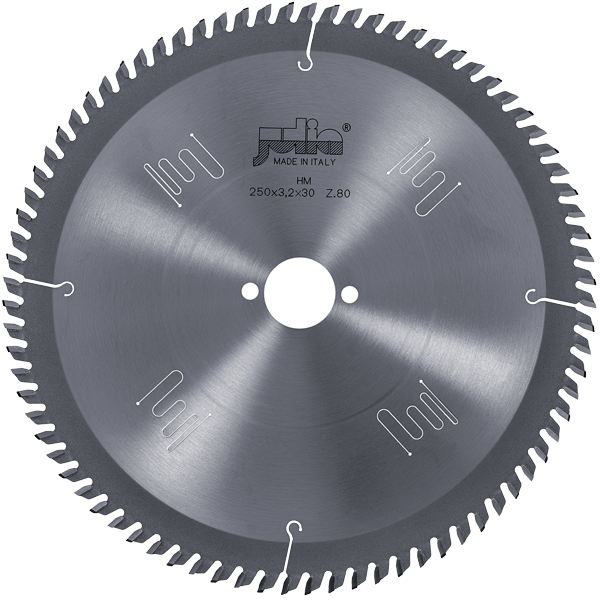 These saw blades have a trapezoidal tooth with positive cutting angle, or hollow tooth with positive or negative cutting angle, to be used with or without scoring blades. Within our production range the customer can also find Carbide tipped circular sawblades for dry cutting on portable machines such as Bosch, Makita, Jepson, Hitach – for cutting metals such as steel, light alloys etc, and for cutting plastics, PVC and plexiglass, compound materials, fibre panels, isolation materials, multiplex panels and solid wood, laminates, chipboards, plywood, wood with nails or metal clips etc.